TUESDAY’S REVOLVING BOOK ~ SPECIAL FOR BREAST CANCER AWARENESS MONTH is the romantic suspense DEADLY SECRETS by Leeann Burke. Get it for $.99 cents EVERYWHERE! DEADLY SECRETS is an official sponsor for the American Breast Cancer Foundation (ABCF). Proceeds from the sale of this title go to the ABCF. Ms Burke is also donating 100% of her royalties to Breast Cancer research. Please help Lachesis Publishing make their biggest donation to the ABCF by purchasing a copy of DEADLY SECRETS for only $0.99 at your favorite ebookstore and pass along this message to other readers. PHILIPPE LAFRANCE is a well known reclusive writer whose life is suddenly thrown upside down. The grandfather he never knew existed dies. Throughout his own investigation, Philippe learns that his family has kept secrets from him, deep, ugly secrets. A killer is murdering the men in his family. First his father then his grandfather have succumbed at the hands of another. This murderer is trying his utmost to keep secrets buried. Bereft, ROXANNE ST. CLAIR is left to manage a restaurant when the only person who ever mattered to her, her foster parent and mentor, is murdered. She puts her life on hold to find his killer and bring him to justice. Thrown together by circumstance and a mutual goal, Philippe and Roxanne fight their attraction and team up to find the killer, bring him to justice and unearth the truth. To stay alive, they must keep one step ahead of the assassin in order to prevent him from killing his next target, Philippe. Will they succeed in bringing to justice this killer before Philippe becomes his next victim? Will they be able to deal with the truth behind all the secrets? At the age of 12 Leeann put pen to paper and created stories. She finished her first and only short story within weeks. She kept on writing throughout high school, university and her first few dead end jobs. To this day she still has a pen and paper handy. After 22 years of writing she finally got “the call”. 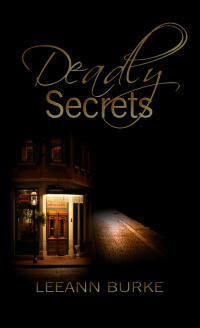 The owner of LBF Books called to let me know she wanted to purchase DEADLY SECRETS. Her dream was finally coming true. She decided to give her dream more purpose by donating funds to the American Breast Cancer Foundation (ABCF) and to a Canadian organization that does Breast Cancer Research. DEADLY SECRETS is also a proud sponsor for ABCF. In a secluded corner of the Rock Heaven restaurant, Philippe brooded. He struggled with the notion that so many people had expressed their sympathy for a man he never knew existed until his death. He checked the room, once again seeking the long dark brown curls and slim figure of Roxanne St-Clair. He braced himself when he noticed her. She was heading his way and her ankle length black dress accentuating her slim waist. Despite noticing anger in her eyes, he shook her hand. He wondered how her soft hands would feel caressing the rest of his body. Philippe mentally shook himself. “Philippe Lafrance, but you already know that.” To his annoyance, silently she settled in the seat beside him and toyed with the straw in her drink. Her eyes widened in shock at the news, only to shrink into small slits. Sharp as a whip, she’d picked up on his sarcasm. “I have a hard time believing that,” said Roxanne harshly. He winced at her sudden sharp intake of breath and instantly regretted the slip. Her eyes darkened to a deep hazel. His words now lay between them like a heavy cloth ready to smother them both.